Leendert Vergeynst | Aargus University Dec 17, 2018. Bacteria play a major role in cleaning up oil spills and mitigating its environmental impacts. A new review examines the major limiting factors for microbial degradation in Arctic environments. New economic developments in the Arctic, such as trans-Arctic shipping and oil exploitation, will bring along unprecedented risks of marine oil spills. The world is therefore calling for a thorough understanding of the resilience and “self-cleaning” capacity of Arctic ecosystems to recover from oil spills. Although numerous efforts are put into cleaning up large oil spills, only 15 to 25% of the oil can be effectively removed by mechanical methods. This was the case in major oil disasters such as the Exxon Valdez spill in Prince William Sound, Alaska, and the Deepwater Horizon in the Gulf of Mexico. Future spill will be no different. Oil-eating microbes played the major role in degrading the oil and reducing the impact of the spilled oil during these past oil disasters. “We are now presenting a first assessment of the microbial degradation potential in seawaters off Greenland”, postdoc Leendert Vergeynst, Arctic Research Centre at Aarhus University, explains. The research group has identified six factors challenging the microbes in Arctic seas. Low temperature changes the chemical properties of spilled oil and slows down biodegradation. For example, cold oil is more viscous, which hampers oil dispersion. The efficiency of microbial degradation is decreased when oil is not dispersed in small droplets. Waves also plays an important role in breaking the oil into droplets. However, where there is sea ice, there are much less or no waves. The Arctic is generally an environment with very low amounts of nutrients such as nitrogen and phosphorus. These nutrients are not present in the oil and oil-eating bacteria therefor need to find them in the water. Few nutrients result in reduced activity of the oil-eating bacteria. Massive phytoplankton (algae) blooms and suspended mineral particles released by glaciers occur during the Arctic spring and summer. The concentrations of particles from glacier outlets and algae blooms in Arctic waters can be magnitudes higher than in the Gulf of Mexico, where phytoplankton, particles and oil droplets were sticking together and sank to the seafloor, forming a “dirty blizzard” during the Deepwater Horizon oil spills in 2010. Microbial degradation of oil on the seafloor is much slower than in the water column. The 24-h sunlight during the Arctic summer may help the microbes to break up oil molecules into smaller pieces. However, it may also make the oil compounds more toxic for aquatic organisms. 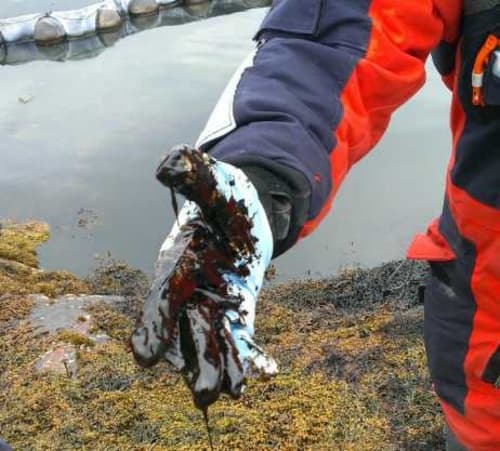 We still need a lot of knowledge to properly understand the effect of sunlight on oil spills in Arctic ecosystems. Regular small oil spills in other marine waters have adapted (‘learned’) microbes to eat oil molecules. However, the Arctic is still a very pristine environment. The researchers are therefore currently investigating if the microbial populations present in the Arctic have adapted to degrading oil compounds. “We are especially concerned that the most toxic molecules in the oil, such as polycyclic aromatic hydrocarbons, may be the most difficult to degrade” says Leendert Vergeynst.